I’m going to show you an object. Please make a guess what it is. Don’t scroll down for the answer. Guess first! I photoshopped the label away so you can’t tell. Haha. It will make you look good! So, what did you guess? 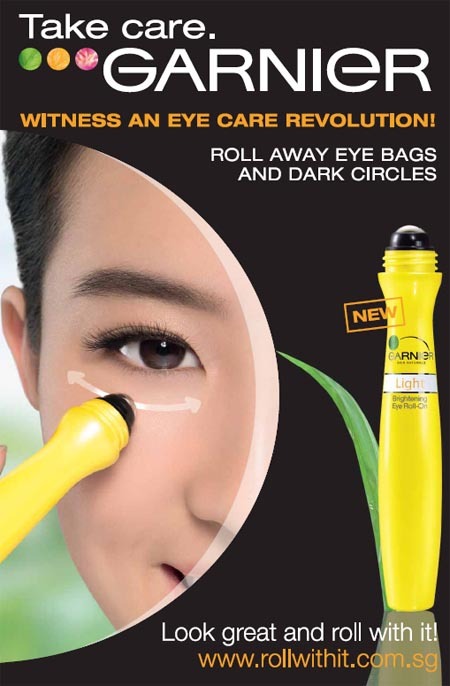 It’s a revolutionary new product recently lauched by Garnier called the Garnier Light Brightening Eye Roll-On. Check out this video of us going around asking unsuspecting strangers to guess what it is! Now, this is the exciting thing I mentioned that had kept me so busy I didn’t have time to review games. As part of the product launch, Garnier has started a fun campaign involving videos and contests and prizes! I’m the poster girl for this campaign (or maybe the term should be “video girl” since we’re in the new media age now). I will tell you more about it in a while. First, a word from my sponsor! Okay, that was a word from me. Roll away eye bags and dark circles! The state-of-the-art cooling ball in Garnier Light Brightening Eye Roll-On massages your eye contours as you roll on the eye brightening essence. Massaging your eye contours boosts natural drainage and the metal ball helps to decongest tired and puffy eyes instantly! I could just roll it around my eyes all day because it feels so good, but I think overdosing won’t be a good idea. Haha. Wake up your eyes with… caffeine! Never thought of using caffeine for your eyes, huh? Well, if caffeine can wake you up in the morning, it can wake up your eyes, too. Really! Caffeine is a natural stimulant that boosts micro-circulation, which helps to get rid of puffiness, bags and dark circles effectively. So, coffee bean for your eyes, anyone? With just two rolls around each eye, you’re all set to face the day! The essence you roll on with the metal ball feels cool and light. It absorbs into your skin pleasantly and doesn’t leave any heavy or sticky feeling. Guys can use it too! Like, just hide it in your pocket, and when you feel tired, sneak off to the men’s room, massage your eyes a little with your Garnier Light Brightening Eye Roll-On, then get out there to impress the ladies with your sparkling peepers! After a few weeks of using this product, my eyes feel and look so much better than before. Please check out the Roll With It website now. Okay, maybe not immediately now. Check it out after you finish reading this blog. The campagin features a game called Roll With It, which you can download to your mobile phone. It helps you make all kinds of decisions in life! Ever played Spin the Bottle? Well, this is kinda like Spin the Eye Roll-On. You’re lipstick shopping and can’t decide whether to buy Pearl Lumine or Fiery Temptress. Just press a button on your mobile phone and the game will decide for you! You can also use it to sabo your friends. That is the fun part. Haha. Check out the videos in the website to learn how the game can help you, and how you can use it to sabo your friends. Here’s one of me and my friends gaming! It was a lot of fun filming the videos. The film crew didn’t tell us what to do, most of the time. They put us in real life situations and helped us sabo each other. Okay, and the craziest part is that my friends got so hyped up about the whole thing that they didn’t want to go home after the shoot wrapped! They dragged me to a pub and MADE ME PICK UP A GUY AT THE PUB. The worst part is that this was filmed!!! And my friends said I’d better upload the video or they’ll make me do even worse things in the future. But I still love them because they are super super cool! One of them had this brilliant idea to make a “Roll With It” cocktail while we were at the pub and we all got really excited about it!! The bartender was so weirded out by our antics but he gamely went along with our request to play the Roll With It game. He’s a cool bloke, even though he refused to try our cocktail after making it. Haha. Watch the making of our cocktail! I only have one behind-the-scenes photo taken during the entire shoot. I didn’t have time to take out my camera at all because I was too busy being sabo-ed! But I guess you don’t need to see photos, really. Just watch the videos. During the two days, the Roll With It game helped make so many decisions for us! Do catch the video of me shopping for a birthday cake with my friends. The widget helped us choose a cake to throw Wang Wang a surprise birthday party! This is all real!! She thought she was just attending one of my gaming video shoots, so we managed to surprise her! It was quite a sweet moment. We blindfolded her and made her guess objects either by touching or licking them! Wahahaha! It’s so cool the way we surprised her! Besides the video shoot, there was also a photoshoot for the website. I had to do a series of poses in different clothes for all the various illustrations in the website. And now… another guessing game. I will tell you the answer later. Right now, I need to get you all excited about the prizes! 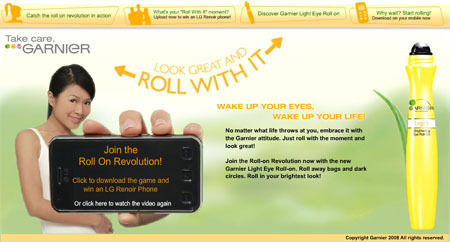 Garnier is giving away lots of product hampers and LG is giving away two LG Renoir phones worth $900 each! The Renoir is a beauty. It’s the phone I use in the videos, and also the phone featured on the main page of the website. Just download the Roll With It game, then film yourself and your friends using it, just like in my videos! After filming it, upload your masterpiece to the website. If your video is selected, you could be the proud owner of an LG Renoir! I can’t wait to watch all your videos. Can you top mine? Can your friends top my crazy friends? Yes, I’m challenging you to come up with your most creative and fun Roll With It Moments! It’s a giant mutant psychotic bat! It’s the photographer trying to take a close-up photo of the phone for the homepage of the website!! Haha! Because the phone is so glossy, his reflection could be seen on it, so he had to cover himself with a black sheet while photographing me. He looks so cute in his bat suit! Well, do try the product, watch the videos, download the game and make your own videos. I’m sure everyone wants to look great and roll with it. Using the Garnier Light Brightening Eye Roll-On, you can look great after rolling away your eye bags and dark circles. This will give you the confidence to roll with your everyday life! And get all your friends in on it, too. 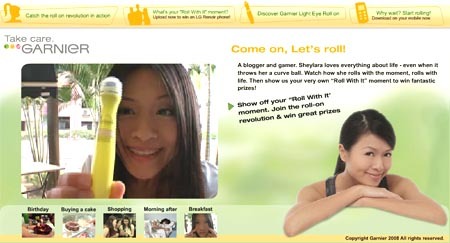 Join me in the roll-on revolution! So… that’s the secret why you dun have panda eyes from lack of sleep and all those late nights gaming n blogging. You look great in all the photos. Ohhh I see. At first I thought it’s a toy for, errr, “toilet activities” (ke ke ke). Yeah, Garnier is good. It’s like a cool mint to the skin. Such a long post ! ~ Hahas. So to win, we have to download the game to our mobile phone, go challenge our friends and come back to upload the video of this challenge to the site, am I right? 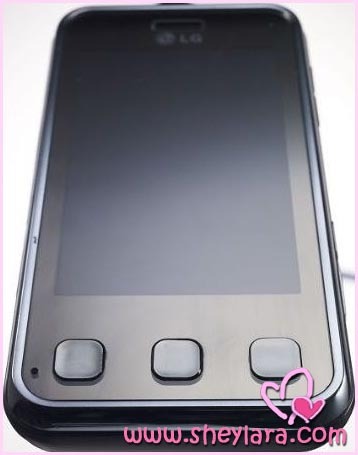 I soooo want to win this LG Renoir Phone. I am gonna take a chance ! tiger4: Thanks for the compliment! I hoped I didn’t look scary… with so big closeups. Haha. Haha, I guess most guys will always find cosmetic accessories a mystery. Nowadays they’re coming up with more and more new-fangled stuff that even I am starting to find many things a mystery! Relax: Hahaha… you and your toilet activities! So, you mean you used Garnier before? Good luck with your vid! I can’t wait to see it!! Last time I used Garnier’s blue liquid to cleanse my face. Nowadays I use Biore. This look interesting. Is it avaliable in store already? is Liu Yi Fei rite? wow.. u look so gorgeous and fresh! By the way, I noticed that the director featured the other girl quite a lot too. Who is she and what is her role? First I thought its a flashlight, than when you started describeing it I had a different idea comeing to my mind… lets just say I thought it to be a masageing tool ;] . This thing, if works as advertised, is friggin awsome! I sleep 4 – 6 hrs a day tops and constantly have the zombie look [Never Again Volonteer Yourself…], this could be a rly awsome thing for me, Im already energy drink junkie, this seems less destructive for my body ;] . As for second question, looked like Star Wars fan with a camera ;] . i knew what it was cos i’d wanted to buy it! haha.. darn, i want the renoir too.. but shy to make the video ahem. like the vidz where they made you do the PUA thang. muahaha..
Haha. From all the comments above, everyone who saw the roller will come up 2 answers. The obvious is flashlight, another is a “massaging” tool that starts with a D.
Hmmm….. maybe it really makes me feel good. She feels good, I feel good. can this be used with our makeup on? ..can i lick Garnier Light Brightening Eye Roll-On? You know what? The first thing I said when I saw the ad in Her World magazine was “I WANT TO BUY THAT! !” I have been using the Garnier Light eyecare series and I must admit it is very very good! Yes its available in Guardian’s and Watsons already.